Is the D5100 a winner for Nikon? Read on to find out. Although there has been some overlap, digital SLR development has gone through some quite distinct phases. Initially the battle was to produce affordable models, and once this was achieved manufacturers turned their attention to producing cameras with higher pixel counts. This was followed by a push in sensitivity levels and improved low-light performance. ). We've also added a new sensitivity sequence of raw and JPEG images and the video below. During these development phases camera functionality has also expanded, with manufacturers capitalising upon the benefits of digital technology and introducing features such as Live View, video and dynamic range optimisation systems. Now, there's a drive to make these increasingly complex and versatile SLRs easier to use, while at the same time helping photographers be more creative. 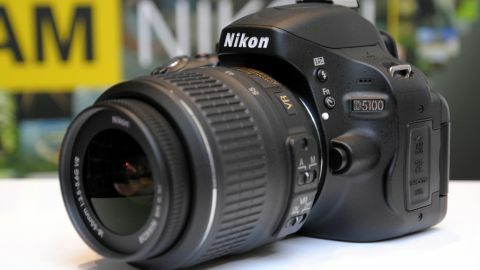 The Nikon D5100, which serves as the Nikon D5000 replacement, typifies this era in DSLR evolution. It may not have the 24 million pixels of the Nikon D3200, but for many the D5100's 16.2 million pixels is enough. In addition, the D5100 has an articulated 3-inch LCD screen, Special Effects and fully automated Scene modes, along with the more advanced PSAM exposure modes. So on paper, it seems to offer pretty much everything the aspiring photographer could wish for, with plenty of opportunity to take creative images. Let's see. As Nikon's D5000 replacement, the Nikon D5100 sits above the Nikon D3100 and D3200, but below the D7000 in the lineup of Nikon DSLRs. It costs £550 in the UK and $750 in the US for the body only. Yet the Nikon D5100 features the same 16.2-million-pixel CMOS sensor and EXPEED 2 processor as the Nikon D7000. This means raw images are saved as 14-bit files and users can expect similar quality results with the two cameras. However, like the Nikon D5000 it replaces, the D5100's white balance and metering systems use information from a 420-pixel RGB sensor (the D7000 uses a 2,016 pixel RGB device) and its autofocus (AF) system has 11 points. While it may not have the 39 points of the D7000's AF system, the D5100's Multi-CAM 1000 AF module performed well in the D5000 and Nikon D90 (which has not been discontinued; read our Nikon D90 review). Like the D7000, the D5100's native sensitivity can be set from ISO 100 to 6400, and there are four expansion settings topping out at the equivalent of ISO 25,600 (Hi 2). On those rare occasions when this is not high enough, Nikon D5100 users can select the Night Vision Special Effect mode, which pushes the sensitivity to ISO 102,400. This value is only matched by top-end DSLRs such as Nikon's full-frame D3s. However, while the D3s can shoot in colour at ISO 102,400, the D5100 can only record monochrome images. In manual exposure or shutter priority mode when the shutter speed is 1/250sec or faster, the Nikon D5100 can shoot continuously at a maximum rate of 4fps for around 100 highest quality JPEGs or 20 raw images or 12 simultaneous raw and JPEG files when a class 6 SD card such as a SanDisk Extreme III is installed. While this is impressive for a camera of this level, keen action photographers may look enviously at the 6fps shooting offered by the D7000. It's also worth bearing in mind that it takes around 1 min 50 sec for the D5100 to write 100 Fine JPEGs to the SD card. Perhaps the most noticeable upgrade that the Nikon D5100 makes on the D5000 is with the LCD, which goes from being a 2.7-inch 230,000 dot display to a 3-inch 920,000 dot screen. This matches the size and resolution of the D7000's screen and it should make a significant difference when using Live View and focusing manually. It was something of a disappointment that the D7000 doesn't have an articulated screen, but Nikon has not made this mistake with the Nikon D5100. Unlike the D5000, however, which had the articulation join at the bottom on the screen, the D5100's screen is hinged on the left. This makes the screen easier to use when the camera is on a tripod. In addition to the Active D-Lighting (ADL) dynamic range optimisation system that we now expect with Nikon SLRs, the Nikon D5100 has an HDR (high dynamic range) mode. When this is selected the camera takes two exposures, one over and one under the 'correct' exposure and merges them automatically into a single image with more shadow and highlight detail than normal. It could prove useful in high contrast conditions if the effect is subtle and not overtly 'HDR'. Although there's a lot packed into the D5100, including full HD (1080p) video and multiple exposure capability, Nikon seems proudest of its Effects modes. These allow the user to apply special effects (Night Vision, Color Sketch, Miniature, Selective Color, Silhouette, High Key and Low Key) to images as they are captured – rather than post capture as with the Nikon D3100 and D7000. Furthermore, the impact of these effects can be seen on the screen when the camera is in Live View mode. While these are fun and allow the user to create some interesting images, it's disappointing that its not possible to save raw files at the same time as the JPEGs when these effect options are selected.